The ancient Mayan pyramid Pirámide de los Cinco Pisos is over 100 feet tall. The ancient Maya were an innovative people. 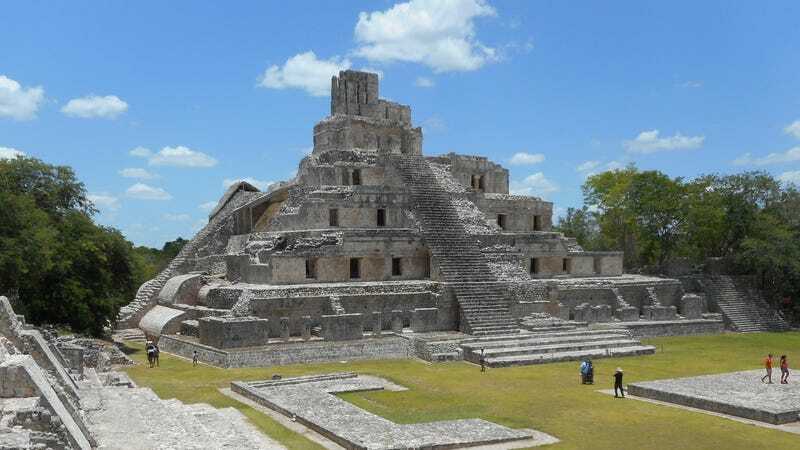 They constructed intricate cities throughout the tropical lowlands of the Yucatán Peninsula, communicated using one of the world’s first written languages, and created two calendar systems by studying the stars. But despite their achievements, the thriving Mayan civilization mysteriously collapsed sometime between the eighth and ninth centuries. We still don’t know exactly why. By analyzing sediment from Lake Chichancanab in the Yucatán Peninsula, Gázquez-Sánchez and his colleagues found that compared to today, annual rainfall decreased by between 41 percent and 54 percent over the multi-decade Mayan drought. When the drought was most severe, rainfall plummeted by as much as 70 percent, the researchers wrote in their study published Thursday in Science. The team also found that the region’s relative humidity fell by somewhere between 2 percent and 7 percent compared to today’s climate. Those numbers have less direct implications for ancient Mayan crops, but they are an indicator that climate change was happening on a larger scale, Cambridge paleoclimatologist and co-author Nick Evans told Gizmodo. Gázquez-Sánchez said this method of analyzing “fossilized water” could reveal a lot about worldwide climates ranging back millions of years. It could even tell us about the climate histories of other planets: Mars, for instance, also has gypsum deposits. There’s still a lot the method could reveal about the ancient Mayan civilization collapse, too. Douglas told Gizmodo the new study is definitely a preliminary one, and is more of a jumping off point. But it is promising.